(PhysOrg.com) -- University of New South Wales's action androids have made it to the grand final of the world's biggest robot soccer competition - only to be knocked out by a team from Germany. The Socceroos may be out of the World Cup but Australia has done itself proud on the soccer pitch in another international competition. 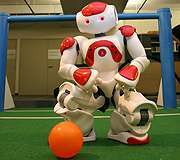 The UNSW robot soccer team has made it to the grand final of RoboCup 2010, the world’s toughest test of android ability - only to be knocked out by a team from Germany. The rUNSWift team, from the School of Computer Science and Engineering at UNSW, progressed easily to the finals against teams from universities worldwide at the three-a-side event held in Singapore from June 19 to June 24. After defeating Carnegie-Mellon University 6-0 in the semi-final, UNSW lost 6-1 to Germany’s University of Bremen in the grand final. UNSW team leader, Associate Professor Maurice Pagnucco, said developing coding which enabled the robots to move quickly was a key advantage but getting through to the showdown against Germany wasn’t without casualties. "In the finals there was a very strong burning smell coming from one of the robots - we had to sub that guy off," he said. rUNSWift beat teams including the University of Texas, Israel’s Bar-Ilan University and Germany’s TU Dortmund. It was also the only Australian team out of three - the University of Newcastle and the University of Technology, Sydney also competed - to advance past the initial rounds. The rUNSWift team did come away as the world’s best in the Challenge category for robot ability. UNSW’s Team CASualty also recorded victory in the Rescue Robot competition, taking out the award for Best Autonomous Robot for the second year running.